Ever on the lookout for the “perfect” song lyrics app, my most recent search led me to MusicID With Lyrics by Gravity Mobile. Behind the Music: MusicID With Lyrics not only works with songs you’ve stored on your iPhone, iPod touch, or iPad; it also identifies songs playing externally, providing lyrics, artist info, and other data. Listening accuracy: MusicID did quite well in picking up the songs in a variety of environments. I particularly liked the spacey graphic effects it displays when listening and searching for songs. Lyrics Quality: Again, the app did well in grabbing lyrics to songs; even some of the less-main-stream tracks in my collection. However, it did return the wrong song lyrics a few times. 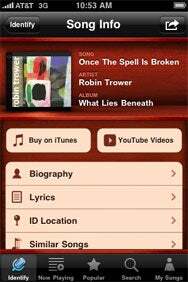 Breadth of Info: The app provides quite a bit of info beyond lyrics, including links to iTunes, YouTube videos, artists biography and a list of similar songs. Sharing: This is MusicID’s biggest weakness. Almost every app in the app store will let you post to Twitter and Facebook, but MusicID only lets you share your discoveries with your friends via e-mail. I think it’s important to note that, rather than sending via your own e-mail account, MusicID appears to route all your messages through the developer’s servers, which could give the developer access to your friends’ e-mail addresses. In order to protect your friends’ privacy, I would skip this feature altogether. All in all, I like MusicID, primarily due to its ability to listen to music rather than simply link to your own music library. It compares quite favorably with similar apps such as Shazam Encore and SoundHound, and is a compelling alternative at only $1.